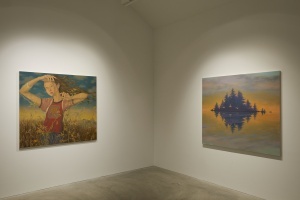 Tomio Koyama Gallery is pleased to present “Arcadians,” a solo exhibition of works by Atsushi Fukui. 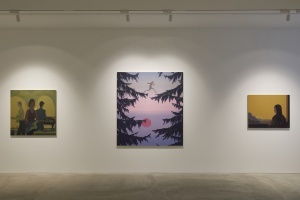 The exhibition marks the artist’s seventh solo presentation with Tomio Koyama Gallery since his previous showing five years ago, and features a selection of new paintings. 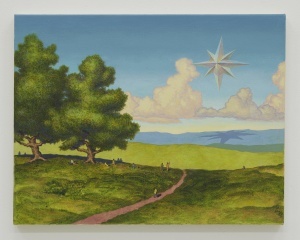 Inspired by his original stories and creative contemplations, Atsushi Fukui’s paintings depict utopian worlds that permeate with an air of peace and tranquility. 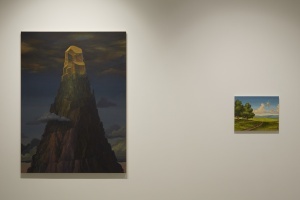 From mushrooms and trees, to a young girl in the forest, animals, fragments of contemporary everyday spaces, scenes of ancient times, and the vast expanse of the universe –various elements resonate with another to create distant imagery and a sense of scale that transcends time and space, almost reminiscent of epic narratives dating back to the times of mythology. Landscapes and motifs painted in meticulous detail manifest in the form of metaphorical and philosophical worlds through the use of lucent bluish tones and beautiful matière. As Fukui himself states, “there is no concrete narrative, yet I like to make it seem as if there is a story” (illustration, Genkosha Co., Ltd., March 2005 issue), while the images depicted are at once realistic and recognizable, they present themselves as “symbols” of certain concepts and phenomena rather than communicating a fixed meaning. The viewers, as if connecting the fragmented imagery within the works to create their own stories, are summoned on a journey of imagination to an otherworldly ream. 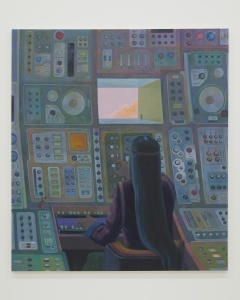 With painterly techniques and themes in his works also influenced by his childhood fasciation with American and European science fiction comics, as well as his history of distancing himself from art for ten years to pursue a career in music, Fukui has collaborated in providing cover designs for the records of musician David Silvian. Based on the theme of “how the world would have become more free and full of surprise should there have been open contact between earth and extraterrestrial civilizations over 100 years ago,” the works presented in this exhibition depict a hypothetical world 100 years since the fusion of earth and extraterrestrial civilizations and the people who live there. In the eyes of Fukui, such a world is a form of “Arcadia” (an ideal world), and the people who live there are “Arcadians” (residents of the ideal world). 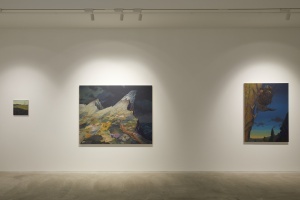 His works are thus conceived through coalescing the imagery that reflects the world of an imaginary timeline close to his personal ideal, and that of our current existing timeline. 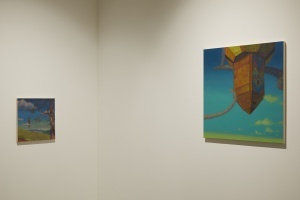 Few human figures can be observed in the “Arcadia” within Fukui’s work. The “Arcadians” whose presences are subtly depicted do not exist as protagonists of a specific narrative, nor do they convey any form of emotion. They are simply an element of “Arcadia,” and are “personified figures” that have taken on human forms, as means to visualize what cannot be seen. The earth and the universe, the current, future, and the past –The undistinguished state of time and space with seemingly no determinable axis instills the viewer with a sense of the uncanny, as well as the anticipation of a significant event that may occur. Furthermore, his works present an opportunity to contemplate profound questions that we usually tend to discard such as the way in which we feel unity in knowing that atmosphere and our existence are connected to the infinite universe, issues about what exactly the universe is, how nature and human beings can maintain a relationship with one another, and how the concept of time is actually perceived. Another significant characteristic of the works presented in this exhibition, is the artist’s departure from a previous style influenced by American and European comics that entailed applying color to the motifs after defining their contours, instead shifting to a more painterly expression in which the contours remain ambiguous. By doing so, he instills a further sense of unity and softness to the surfaces of his canvas. 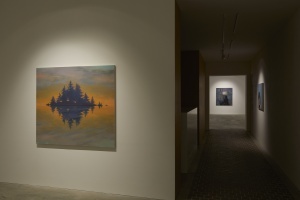 What consistently emerges within Fukui’s work are his distinct perspectives as an artist, and the sense of distance between himself and the real world. Deriving from the experiences of his childhood, he has continued to consciously depict his awareness towards the presence of the individual amidst the masses, and the relationship between oneself and the world. The existence of things is perhaps not firmly determined, but instead are all but our mere preconceptions. What Fukui continues to earnestly confront through painting is the means by which to expand the ideal world of his imagination that is more free and pleasantly interesting –liberated from the living hardships we feel in the real world such as the inconvenience of social rules, as well as the various binding frameworks of national borders and ethnic groups. 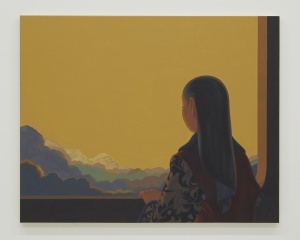 We welcome viewers to embrace the new world of Fukui’s practice that evolves with each exhibition, never ending its quest to break free from the confines of time and space. Atsushi Fukui was born in 1966 in Aichi prefecture. In 1989, he completed his B.A. 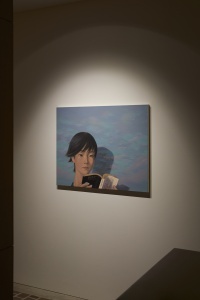 in oil painting at Tokyo University of the Arts. He is currently based in Yamanashi prefecture. His major solo exhibitions include “air” (2016, yu-un, Tokyo) and “Council of Backpacking” (2015, ROPPONGI HILLS A/D GALLERY, Tokyo). His first show at Tomio Koyama Gallery was the group exhibition “morning glory” curated by Yoshitomo Nara (Tokyo, Japan, 2002). 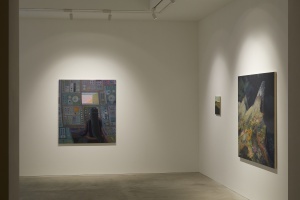 Thereafter, he held 6 solo exhibitions at Tomio Koyama Gallery. 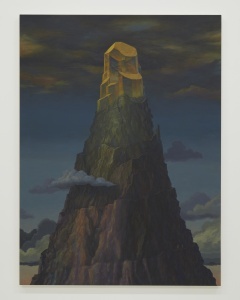 Fukui’s major group exhibitions include “TAKAHASHI COLLECTION Mindfulness!” (2013, Kirishima Open-Air Museum, Kagoshima, Japan [touring Sapporo Art Museum, Hokkaido, Japan]) “ORANGE SKY” (2011, RH Gallery, New York), “Punkt Art 2011 David Sylvian-in cooperation with Atsushi Fukui uncommon deities” (2011, Sorlandets Kunstmuseum, Kristiansand, Norway), “convolvulus: Atsushi Fukui / Hideaki Kawashima” (2009, Michael Ku Gallery, Taipei), “The Masked Portrait” (2008, Marianne Boesky Gallery, New York), “ROPPONGI CROSSING” (2004, Mori Art Museum, Tokyo). His works have been included in the public collections of The Olbricht Collection (Germany), The JAPIGOZZI Collection (US/ Switzerland), The Takahashi Collection (Japan) and The Japan Foundation (Japan).